The Indians opened up Thursday on a gorgeous, if not a bit chilly (compared to the balmy month prior) afternoon against the Blue Jays. The day opened up like a dream, with blue skies overhead and a record-setting crowd oozing with eternal optimism. 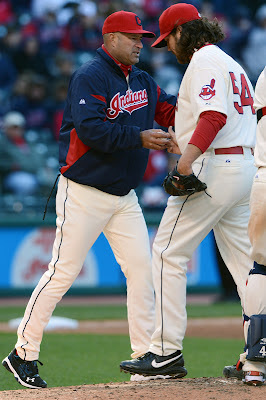 Justin Masterson, the Indians' Opening Day Starter, came out dealing, and by the time he left the game after eight innings (and about 2 hours 15 minutes), the Indians were up 4-1 on the back of Opening Day stud Jack Hannahan's 3-run homer in the second inning. Masterson looked like the ace the Indians want him to be, giving up only two hits and a walk against ten strikeouts. And it was ugly. It was obvious to all that Perez did not have "it" yesterday. "It" being a fastball more than 92 miles per hour. When your closer comes in and throws 23 fastballs in between 8 sliders, they better have some heat, or some movement, and Perez had neither. Single, single, sac fly, walk, and a double later, the game was tied. And soon Perez was headed to the showers. Not before the record Opening Day crowd of 43,190 let him know exactly what they thought of his performance, every one of them booing him off the field. Vinny Pestano, who is widely seen to be most likely to take over the job at some point (soon), came in and put the fire out. But by then the damage was done. The Indians offense went into Witness Protection at that point. In the ninth they had a man on third with one out, and couldn't bring him home. But this game went six more innings and the Indians got, to paraphrase Harry Doyle, "one g*d d@mn hit?!" And that rally (in the twelfth) was quickly squashed by a double play. Hope springs eternal, as they say. But the hope that Indians felt at 3:05 and still at 5:00 yesterday, took a stiff kick in the groin yesterday. "Look how they massacred my boy!" - Don Vito Corleone after Sonny ruined a city's afternoon.